If you haven’t read Part 1 of my trip, CLICK HERE to read it! So you’ve finished reading Part 1? You’re sure? Okay, then I give you my permission to continue on with Part 2. Once again, to see all of my pictures, CLICK HERE. Enjoy! Today was a very early day, as we were taking a day cruise to 3 of the Greek Islands! We were picked up from our hotel at 7:45am and driven to the docks. Sadly, it was a bit overcast, but we were still really excited! Prepare for many pictures! We enjoyed some coffee (well, I had a hot chocolate) and some Greek yogurt with fruit and honey as we cruised to our first location, the island of Hydra (pronounced EE-druh). On our boat, 8:00am. Do we look tired? Along the way, we got to listen to traditional Greek music! I honestly felt like I was in the movie “My Big Fat Greek Wedding.” The instrument the man is playing is called a “bouzouki.” I can’t really describe what it sounds like, but you should definitely go and listen to some bouzouki music. It’s really relaxing! 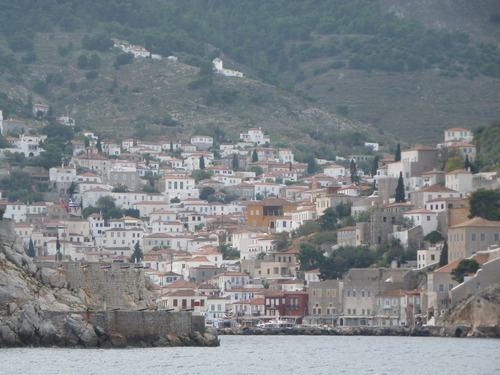 After 2-ish hours of cruising along the Mediterranean Sea, we arrived at Hydra. It was so nice! Not the white homes with blue roofs that you typically think of when you picture the Greek Isles, but beautiful nonetheless. Don’t you think so? We had a lot of fun on Hydra! There were so many cute little shops that we explored, and we really enjoyed just being away from the bustling hub that is Athens. Here I am enjoying a Greek donut! During the time this photo was taken, I didn’t know the Greek name for these, but they are called loukoumades – I found out 2 days later. They are very light and fluffy, not heavy like American donuts, and are drizzled with honey. Delicious! I made some new donkey friends! Not really. I didn’t actually ride them, although wouldn’t THAT have made a great story? We stayed on Hydra for about an hour and half, not nearly enough time to see the island as a whole. However, it was Sunday, so many things were closed. Oh well, there’s always next time. 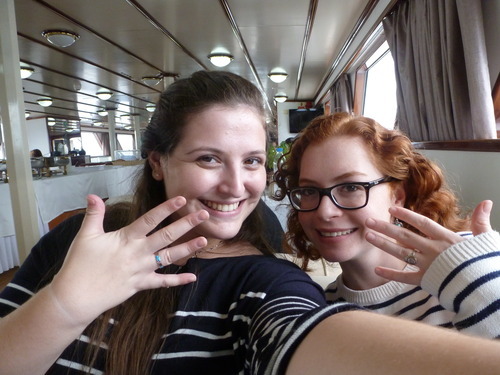 Natalie and I both bought rings on Hydra! Mine is sterling silver with blue opal. Although you can’t see from this photo, the ring is carved in the shape of the Greek key, which is meant to bring good luck to those who wear it! We went back on the boat for the lunch that they provided for us (some salads, fish, and chicken). We sat across from two men from India. I originally thought they were father and son, but it turned out that they were complete strangers. The older man, who said his name was Dave, worked in Bangladesh, while the younger man, who did not give a name, was working for an app start-up company. I considered saying that Israel was the new place for start-ups in the world, but ended up not. It didn’t really come up naturally in conversation. The lunch was good, and we had another hour until stop #2: Poros (pronounced pore-ohs). Hello, Poros! This stop was a very short 50 minutes, and no extra excursion was even offered, so clearly there was not much to do. We just walked around, but mostly everything was closed. Here are a few pictures I took on Poros! Our short-lived visit of Poros was the perfect amount of time. We kind of ran out of things to do and see. Now it was time to move on to our last stop of the day, Aegina (pronounced eh-HEE-nuh or eh-JEE-nuh, depending on how Greek you want to sound). We learned a very fun fact about Aegina: it introduced the pistachio nut to the world! We brought home a few pistachio products for ourselves and our loved ones. Yay! 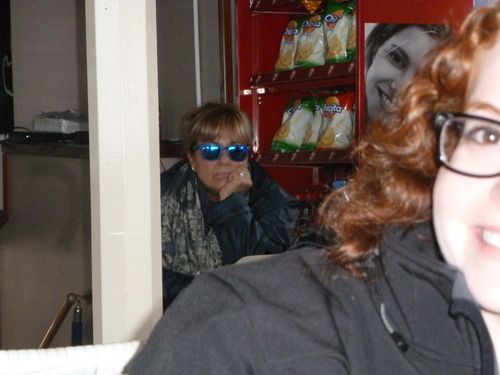 We had about 2 hours on Aegina, so after we explored a bit, we decided to get a snack and a drink. We had some very strongly-vanilla-flavored drink and an arugula salad with haloumi cheese. It was not great, but we were able to look out on the harbor, which made it worth it. We ate and drank as the sun set. Finally, it was time to head home. We listened to some more Greek music and relaxed as we rode back to the Athens shore. We got back to our hotel, dropped off our newly-purchased items, and headed out to dinner. We found a nicer restaurant called “Daphne’s,” and it was great! Much better than lunch or the previous night’s dinner! We shared a Spanakopita, or traditional spinach and feta pie. It was perfect. I enjoyed a glass of Agiorgitiko, a wine native to Greece, along with a traditional lamb stew (as you can see, I was really aiming for the traditional Greek foods). Both were divine. Oh yes, divine. I left completely satisfied with my meal and ready to go to sleep after the long day. The long day before made us wake up pretty late. 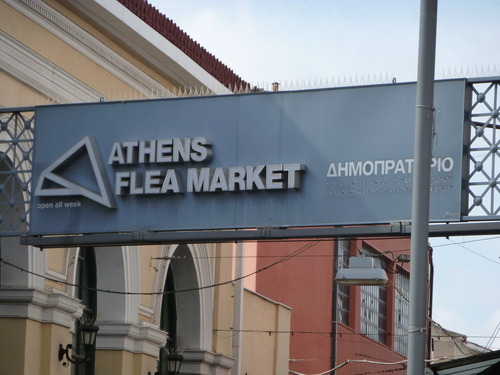 We decided to check out Monastiraki, another Athenian neighborhood that housed a cool flea market. It was only a 20-minute walk from our hotel. We were easily able to spot it. It turned out that the flea market was only open on Sundays, so we had missed it the day before, however there were still many shops open. It was reminiscent of the shuks in Israel. Oh wait, I forgot to mention the best part: IT WAS SUNNY! Yes, for the first day, there was no hint of overcast-ness, no chance of rain, just pure, gorgeous sun! We soaked it up. 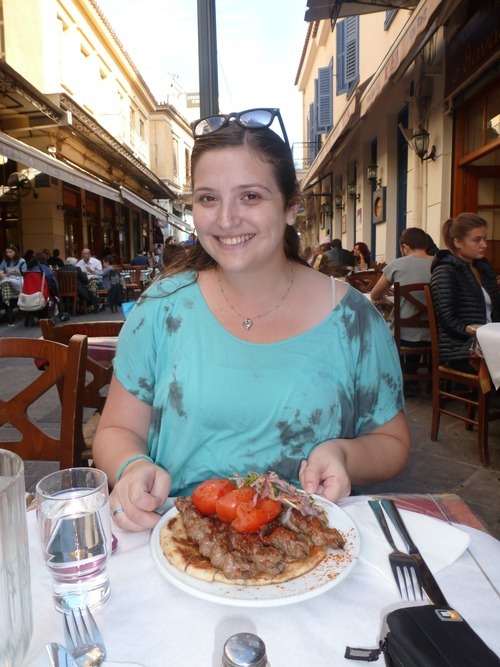 I had been told by a Greek friend of mine that Monastiraki is the best place to get souvlaki. Souvlaki is yet another traditional Greek dish that is a skewer of meat with spices. Nearly every restaurant in the area was selling souvlaki! It was a mad house! All of them were trying to entice us into eating at their establishment. We finally found a place that was huge and sat down. Souvlaki was delicious! 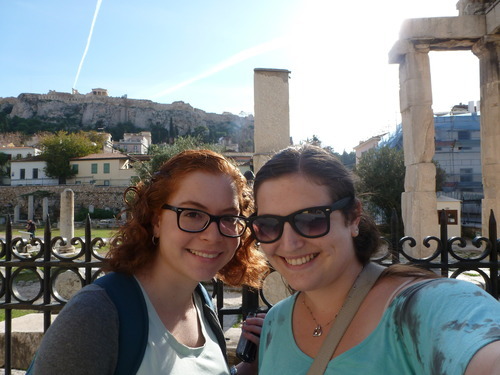 We walked around Monastiraki for a while, taking in all of the sights. Can’t remember if I mentioned this in the first post, but the men in Greece are (mostly) really good-looking! Seriously, it was remarkable to witness. It definitely added a big plus to our trip! Chilling with homing beacon in the background. Thanks for saving us from getting too lost, buddy! We stopped and got dessert at a restaurant after walking around for a few hours. Nothing traditional, just a cheesecake and chocolate mousse cake. Delicious all the same. We headed back to relax for a bit and change for the evening. After a sufficient nap and relaxation time, we headed back to Monastiraki for drinks and wandering. It was a very cool area, and we were eager to see it at night. We also wanted to see the Acropolis all lit up! And so we did. We found a cool cocktail bar called “Ciccus” just 2 restaurants away from where we had dessert, so we headed back there. 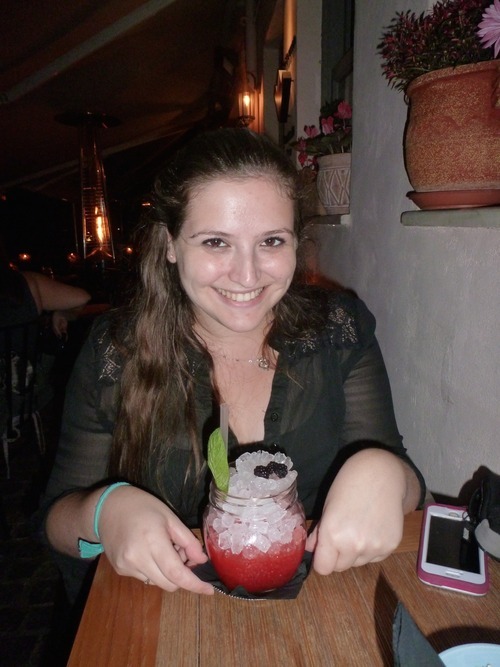 I had the most delicious drink ever! I believe it was vanilla vodka with berries (among other ingredients). I had two. Sorry I’m not sorry. We also ordered some potatoes (more like circular french fries) with cheese. A yummy appetizer. Now we just had to figure out where we wanted to eat dinner. 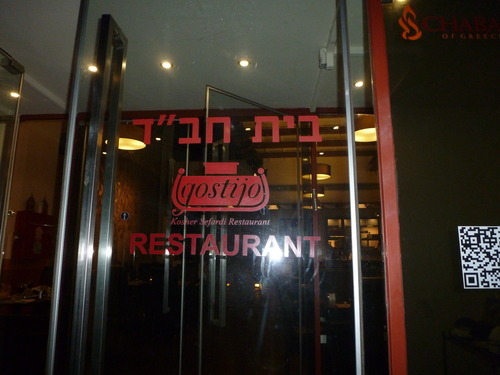 I looked on TripAdvisor, our best friend on the trip, and found a kosher restaurant called “Gostijo” just a 5-minute walk away. 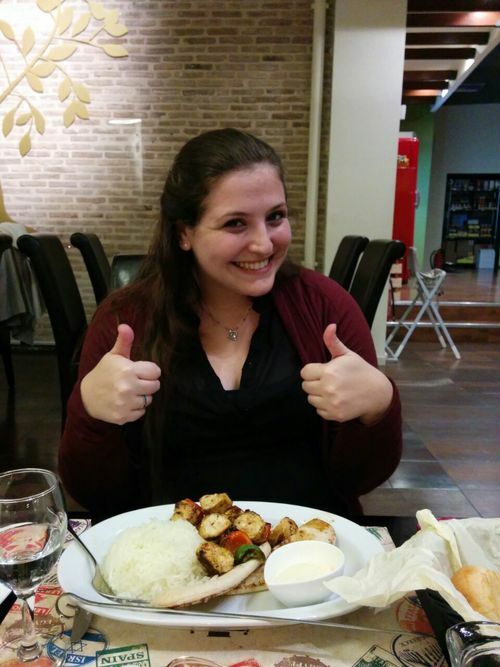 A kosher restaurant in Athens? Who would’ve thought? Since Natalie keeps kosher, we had to at least go and check out their menu. So we went there and low and behold, it is owned by the Chabad house in Athens! I ordered a souvlaki and Natalie ordered gyros. Both were made with chicken, and tasted very similar. Like I said, an experience. After we finished our nice kosher meal like two good Jewish girls, we headed back towards our hotel. We heard some bouzouki playing at a restaurant and decided to investigate. The restaurant was empty, and before we could protest, we were being ushered to a table. 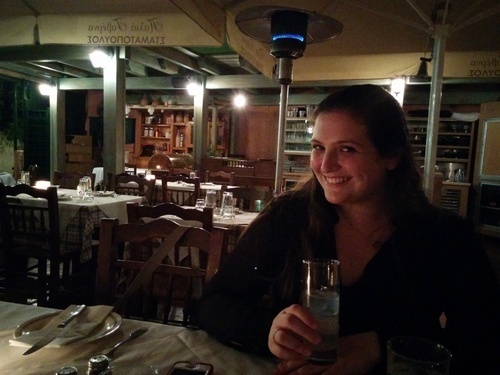 We ordered ouzo, the traditional Greek anise-flavored alcohol. It was ridiculously strong and did not taste very good. Kind of like alcoholic black licorice. Ew. We cut it with a lot of water. We forced down a bit of it and then went back to the hotel for bed. Once again, I don’t want this to be horribly long and boring, so this is the end of Part 2. Part 3 will be coming shortly! 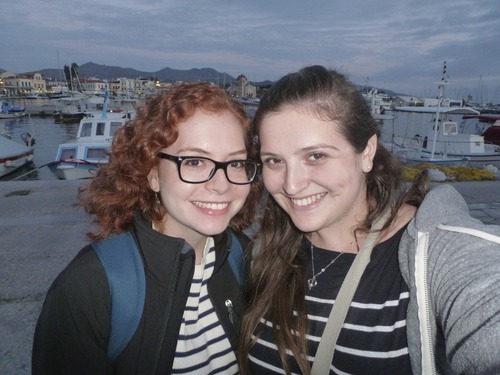 Hope you’re enjoying reading about my Greece adventures!